The competition will be broken up into 3 DIFFERENT ROUNDS with each DJ performing 3 MINUTE ROUTINES. (Depending on how many DJ’s enter) TOP DJ’s from the “Prelims” will advance into the “Semi-Final” round. Only the TOP 2 DJ’s from the “Semi-FInal” round will advance into the “Final”. DJ routines in every round will be judged on 4 things, with each criteria holding a different level of importance in the judging scale. Here are the guidelines for DJ’s that want to participate. DJ’s are not allowed to repeat routines from earlier rounds. In case of a tie-breaker, the DJ battle goes to a “Scratch Off”. DJ’s will scratch for a minute & a half, then be judged to determine who wins the tie. 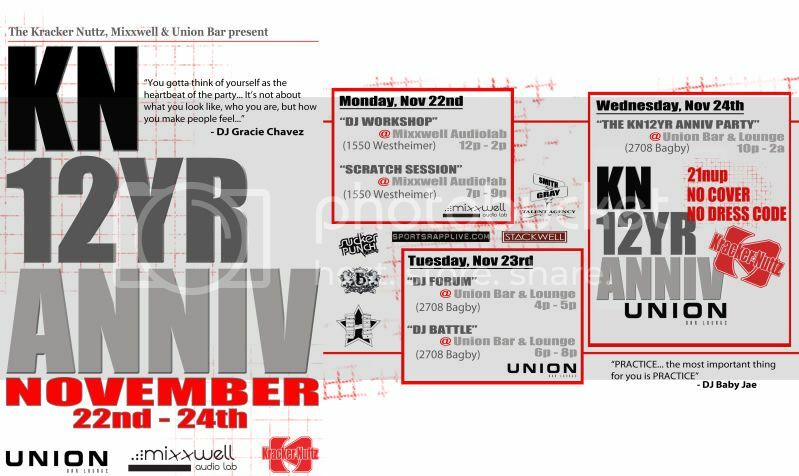 KN12YR ANNIV… HERE’S WHAT’S UP! A battle between DJ’s from around the city testing their skills. There is NO 2nd or 3rd place… the winner takes it ALL!